If you live in North Port or the surrounding area in FL, then you have picked the perfect site to find a veterinarian. Kathryn Rivers is a licensed veterinarian, treating dogs and cats. Your pet's health and well being is very important to us and we will take every step to give your pet the best possible care. We have a number of resources for you to learn about how to take better care of your pets. Browse around and look at our articles and pet videos. The best veterinary care for animals is ongoing nutrition and problem prevention. If you want to ask a question call (941) 426-0661 and we'll promptly get back to you. Our North Port veterinarian office is very easy to get to, and you can find directions on our Contact Us page. You can also subscribe to our newsletter which is created especially for North Port pet owners. In between your veterinary visits, your pet will benefit from you reading these free informative articles. 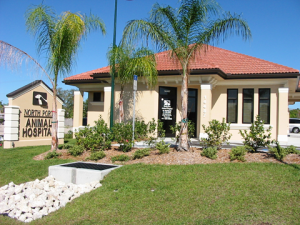 North Port Animal Hospital has been located in North Port since 1985, we are North Port's oldest and only full service veterinary hospital. Dr. Martellini is a non-accredited practise member in AAHA. We also maintain membership in the AVMA, The American Veterinary Medical Assn. and FVMA, Florida Veterinary Medical assn. In 2008 we relocated into a newly constructed updated medical facility across the street from our old facility location.